Guideblocks is an interactive user assistance tool that extends web apps to provide dynamic, contextual help, user onboarding tours, in-app messages, and more. Users can create, organize and maintain an online help center, with unlimited categories and hierarchically structured articles. 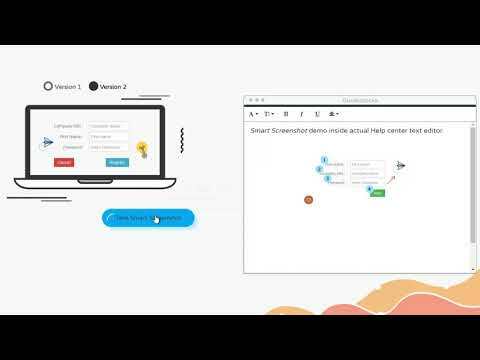 Guideblocks’ unique 'Smart Screenshots' feature allows users to automate help content, and keep in sync with changes to web apps and articles in the help center. Nowadays apps are developing faster than ever before, with daily builds/deploy cycles and help content is usually left behind. 'Smart Screenshots' will keep help articles up to date with UI changes in the app, along with annotations and images crop/resize. Users can integrate and link help center articles with dynamic and contextual help integrated right inside the web application. Unobtrusively display relevant help content and allow users to search for help when needed. Guide users with tours and walkthroughs making new customer onboarding as easy as possible. Users are notified with in-app notifications and messages to help make training and new features adoption a breeze. Frustrating.I like the overall way that Guideblocks breaks up answers, knowledge-base, etc. The *idea* of integration into SaaS is wonderful. I like the overall way that Guideblocks breaks up answers, knowledge-base, etc. The *idea* of integration into SaaS is wonderful. The Chrome extension doesn't work, support didn't respond in several business days, and styling is ineffective. For instance, adding a company's logo doesn't resize the logo to a proper size. Whatever size logo you upload is the size you get, even if it's monstrously large. The Chrome extension fails every time I click on it, and it's one of the main selling points - that I can quickly screenshot my app and insert into help pages. All plans comes with a free trial. No credit card is required. Professional: $29 per month, paid annually at $348. Guideblocks helps users better understand web apps with dynamic and contextual assistance. Act proactively, add tours and context help to clear the path of new user onboarding, increasing chances for conversion. Explain apps instantly with walkthroughs and in-app notifications, reducing support calls and making users happy. Improve application experience with Guideblocks and extend it with step-by-step instructions and in-app searchable help content. Lower time to market, free some time for dev teams, letting them focus on business features – and Guideblocks will take care of interactive user assistance. Keep in sync images in help articles, with annotations and on crop/resize, with ongoing changes in the apps’ user interface. Below are some frequently asked questions for Guideblocks. Q. What type of pricing plans does Guideblocks offer? Q. Who are the typical users of Guideblocks? Q. What languages does Guideblocks support? Q. Does Guideblocks support mobile devices? Q. Does Guideblocks offer an API? Yes, Guideblocks has an API available for use. Q. What other apps does Guideblocks integrate with? Q. What level of support does Guideblocks offer?